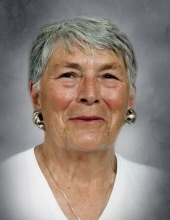 Patricia “Pat” Cochran, 88, of De Pere, passed away on Monday, March 18, 2019. The daughter of Kenneth and Audrey (Fowler) Fox was born in Bellevue, Ohio on June 18, 1930. Pat was the older of two children. After high school, she went on to graduate from Ohio State University. She worked as a buyer for J.L. Hudson in Detroit, where she met John “Red” Cochran. They married in Detroit in 1956. In 1959, Pat and Red moved to Wisconsin, beginning their long association with the Green Bay Packers. Pat was an enthusiastic volunteer within the community, and particularly enjoyed her work with the Brown County Historical Society. In addition, her years of work at the Heritage Hill State Historical Park and the De Pere White Pillars Museum were a point of pride. Pat is survived by her children, Tracy (David) Moore, Highland Lakes, NJ, Cindy Cochran, New Orleans, LA, and Russ (Margaret) Cochran, St. Louis, MO. She is further survived by her brother, Ken Fox, Bellevue, OH, and grandchildren, Jay Gabel, Suzie Cochran, Kevin Cochran, Hannah Moore, Carey Moore, and great-granddaughter Hailey Luthcke, as well as a number of nieces and nephews, and very special friends. Pat was preceded in death by her husband, John “Red,” and her parents, Ken and Audrey Fox, as well as other extended family members and dear friends. A memorial service will be announced at a later date. In lieu of flowers, donations can be made to the Bay Beach Wildlife Sanctuary or the NEW Zoo. To send flowers or a remembrance gift to the family of Pat Cochran, please visit our Tribute Store. "Email Address" would like to share the life celebration of Pat Cochran. Click on the "link" to go to share a favorite memory or leave a condolence message for the family.